Ideas; Research; Strategies; Analysis; and..sometimes....Quick Thoughts...as general read! Hello, I am Chandrajit and I created this place to represent my opinion and ideas that I am thinking or dreaming which can be shared as knowledge. Here, I am just trying to present my thoughts and imaginations about various diversified things. I am just trying to write down all of it. After spending @18years in Information Technology, one part of me always thinking about future trends in this area but not limited to. On the other hand, I am really fascinated by "Derivatives Trading" as it suits my nature of taking risk always and then with discipline. At present, I am thinking of lot of things but trying to concentrate to quantitative research for Index Options trading. I am trying to devise simple ways for retail traders so that all technical are presumed correct at certain conditions. I am not much excited by technical analysis as I think "Price" as implicit to all parameters. 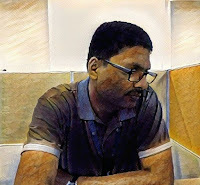 Very quickly, I worked as Software Consultant at various organisation levels for @18 years of experience in Product Management in Engineering sector. Graduated in Mechanical Engineering and then MBA - IT & Systems. Disclaimer: Options involve Risk and are not suitable for all Investors. The information/Ideas/Thoughts provided by Chandrajit is provided solely for general education and information purposes, and therefore should not be considered complete, precise or current. No element presented by Chandrajit should be constructed as recommendation to buy or sell a security or to provide investment or trading advice. Option trading has large potential rewards, but also large potential risk. You must be aware of the risks and be willing to accept them as your own in order to invest in options markets. Active trading is not suitable for everyone. Options trading carries a high degree of risk and is not suitable for all traders. The views, thoughts and opinions expressed in this blog are no way, represent the views, positions or opinions, etc. – expressed or implied – of my employers (present and past). Innovative thinking? Does it need a restart?